It seems to be an ongoing trend, and words of advice you hear everywhere these days! We are never taught to love ourselves as children, It was almost looked down upon in society, like you are either narcissistic or self-centered. We are made to believe, we must put others first and look for love externally because only THEN will we be fulfilled as human beings. But what about SELF-LOVE, where does that fit into the equation? Self-love is just as important, if not more so than loving others. When I think about it, it really does make total sense. When I look back at all the relationships, jobs, my health, finance, you name it, that I sabotaged, it is OH so crystal clear now. It is the same when it comes to my clients. When we really get to the bottom of WHY they aren’t where they want to be in their life, it comes down to the love they lack within themselves. The truth is, we cannot give to others what we don’t possess ourselves. How can we truly love another if we have not fallen in love with ourselves? How can we really become successful doing what we love, if we don’t feel we are worthy of being happy and successful? All this searching we do in our lives to find happiness, doesn’t it always seem to come back to ourselves? If we don’t honour our internal light and feed the flame so it shines like a beacon, how can we attract all that we desire? We have to learn to fall in love with ourselves. If that isn’t enough reason to up-the-anti on your self-love then I don’t know what is sister!? In order to change the messages we give ourselves, we have to go deeper than just telling ourselves we are great. We have to practice it on a deeper level, so it infuses every cell of our being. We have been programmed to think and live a certain way for so long, that it requires a lot of unlearning on our behalf, and this means creating new, healthier messages we tell ourselves on a daily basis. This is something I dive heavily in to, in my 8 Week Self-Mastery Bootcamp – Starting February 15th! 1. Your inner dialog (inner critic) is constantly telling you, you aren’t smart enough, pretty enough, talented enough, successful enough. You name it! You are just never enough. 6. You let your insecurities sabotage the relationships in your life. Are you diggin’ this post girlfriend? There is plenty more where that came from! 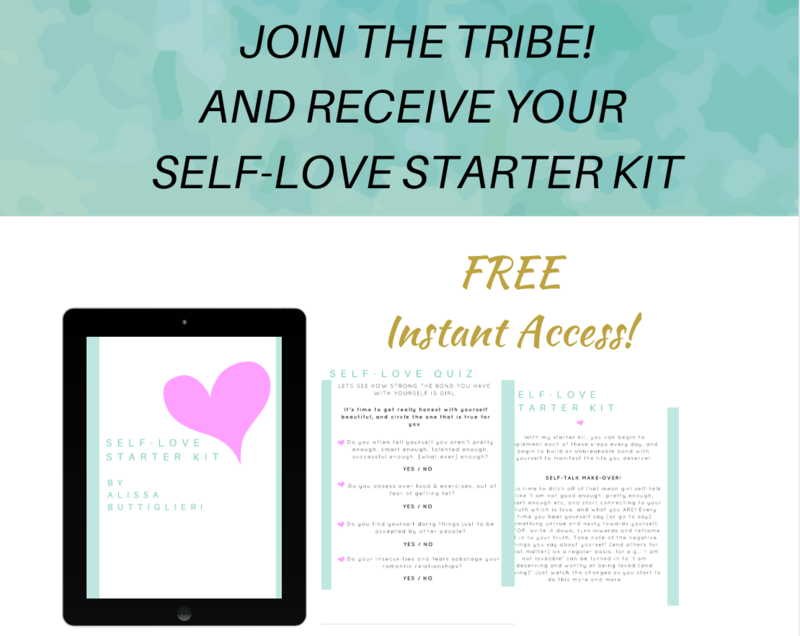 Join my incredible tribe filled with hundreds of amazing women like yourself, and you will receive my ‘Wednesday Wisdom’ post straight to your inbox every week. for FREE just because I freaking love you! If you feel someone else needs to hear this today, then please share away! And as always, thank you so much for being in this space with me, sharing so wholeheartedly. 8 Week Self-Mastery Program – STARTS 15TH FEBRUARY 2016! For a select group of women who are truly ready to turn their LOVE, LIFE and HEALTH around. I AM OPENING UP 10 SPOTS ONLY! STEP IN TO YOUR TRUE AUTHENTIC, POWERFUL SELF, MASTER YOUR EGO AND INNER CRITIC, LIVE A HEART-CENTERED, AND ON PURPOSE LIFE THAT TRULY FILLS YOUR SOUL, ACHIEVE YOUR HEALTH AND WELLNESS GOALS, FORM BEAUTIFUL FRIENDSHIPS AND ROMANTIC RELATIONSHIPS, AND BUILD AN UNBREAKABLE BOND WITH YOURSELF TO MANIFEST THE LIFE YOU DESIRE ?